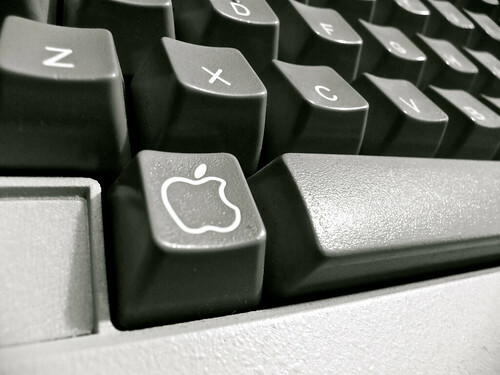 Open Apple key on a 1982 Apple //e. 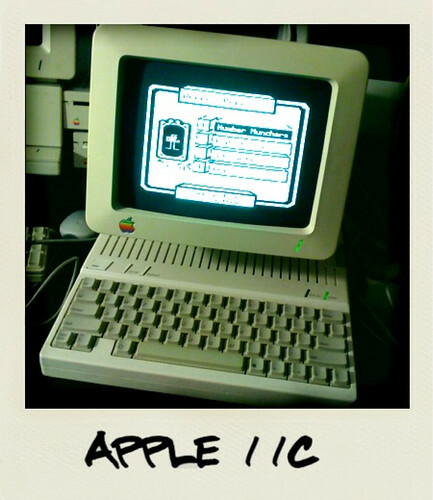 This 1984 Apple IIe has a workstation card installed. When turned on it looks for an Appleshare Server on the network, in this case a 1991 Apple Classic. 1991 Apple Classic acting as a server for a 1988 Apple IIgs. The IIgs has no internal hard drive. Instead it looks on the network for an Appleshare server, which is the Apple Classic. The Classic is running System 7.0.1 and Appleshare 3.0. The IIgs is booting GS/OS 6.0.1. 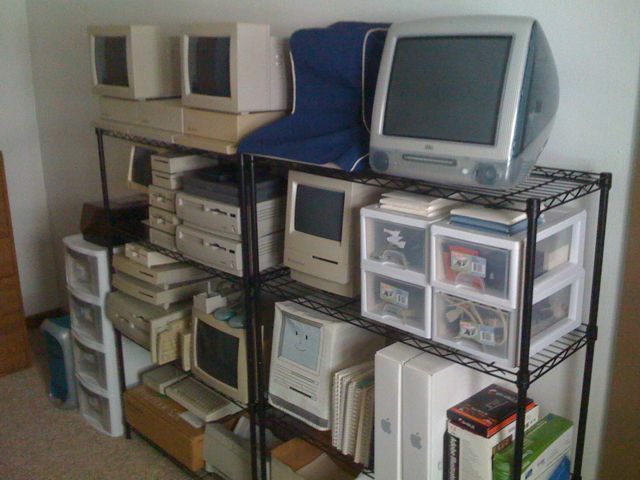 There are still about a half-dozen still in storage, but the Wall-o-Macs is shaping up quite nicely. A week or two ago I purchased two computers from someone through craigslist. 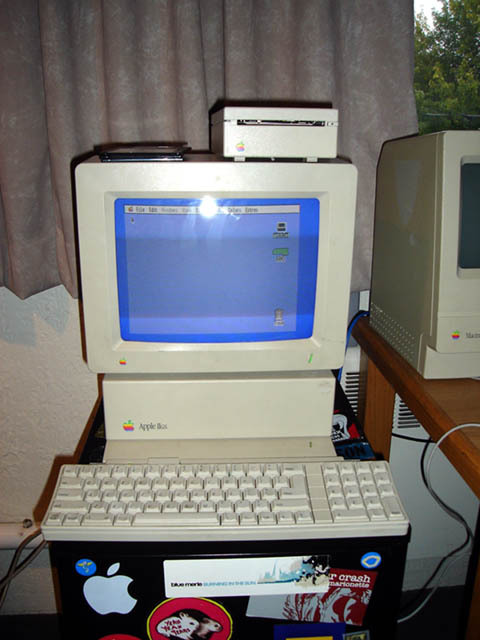 One of the computers was the most powerful Apple II model ever built, the IIgs (ROM 3). This computer presented itself with some challenges to bring it back to life. 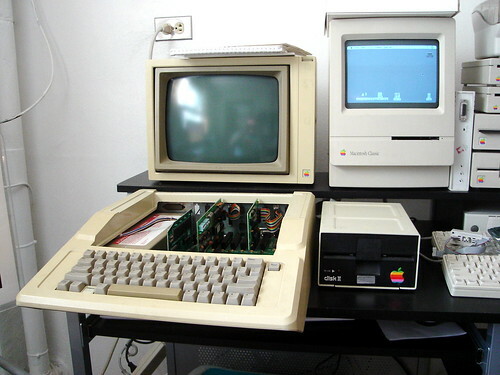 Unlike the Apple II’s I grew up with, this model did not have a 5.25 floppy, but rather a 3.5. The drive also posed a problem in that it would not read standard 1.44mb 3.5 floppies, but 800k formatted disks. In order to get software installed I had to first buy an external USB floppy drive. Anyone you know still use a floppy drive? Didn’t think so. Then I downloaded the software from various sites around the web, loaded it onto floppies, then transferred it all to my 1991 Macintosh Classic. Once all the necessary files were transferred I modified the floppies into 800k disks by taping the top left hole. This process tricks the drive into formatting a 800k disk when promted in Mac OS 7. Once those disks were written it was time to install GS/OS 6.0.1 on the IIgs. Because I only have one floppy drive on the IIgs I had to switch the install disk and target disk more than 50 times. It would load a small portion of the OS, then copy it to the disk, and then repeat the process over and over until done. If there was a second drive I would not have had to switch the disks. Even though the OS is nearly 20 years old the GS/OS is really impressive. 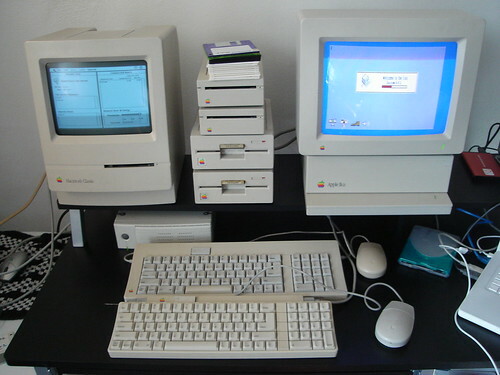 It mimics Mac OS 7’s feel and style as best it can with the hardware resources available. It is hard to believe that the whole device runs from a 800k disk. Steve Wozniak’s brilliance still shines through on this machine. On a side note, I have come to appreciate how fast network infrastructure has improved in the past five years alone. Phones, television, internet, and a variety of other network connected devices now share the internet as their backbone. Their integration into our lives often goes by unnoticed until they cease to function properly. Before the days of wireless internet, or even the proliferation of ethernet networks, data was transported by “sneakernet.” Someone physically had to transport media to its destination, insert the disc, and eject it.